This fish dish is healthy, quick and easy but it looks and tastes super fancy! It’s simple enough for a midweek meal but special enough for when you’re entertaining and as it’s all cooked in a parcel, there’s zero mess! Win, win! Preheat oven to 220 C or 200 C fan-forced. Place cumin, turmeric, mustard, ginger, garlic, coriander and three-quarters of chilli in a food processor. Process to form a paste OR in a Thermomix, place into TM bowl and chop for 5 seconds on speed 7. Scrape down sides. Add yoghurt and process until smooth OR in a Thermomix, mix 10 seconds on speed 4. Reserve 1/3 cup of yoghurt mixture and refrigerate until ready to use. Spread remaining yoghurt mixture over both sides of each salmon fillet. 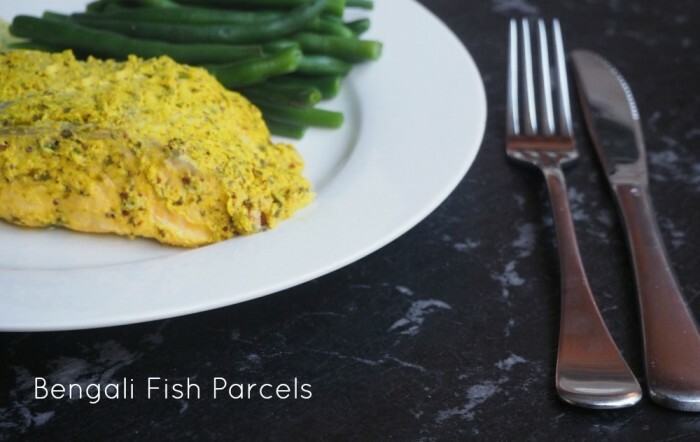 Place each fillet in middle of a piece of foil big enough to make a spacious but well-sealed parcel, and enclose. Place parcels on a baking tray. Bake for 8-10 minutes for medium, or until cooked to your liking. Transfer salmon to serving plates, sprinkle with remaining chillies and serve with green beans, reserved yoghurt and lemon wedges.